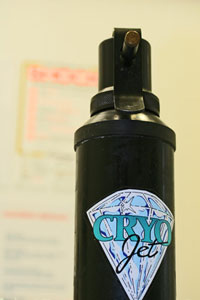 Cryosurgery enables us to treat some lumps and bumps, eg warts and some cysts and tumours, without an anaesthetic being needed. The liquid nitrogen freezes the area instead. This can be a good option eg for some older pets.